Definition: This is a not frills gas law. It simply combines three other gas laws (Boyle’s Law, Charles’ Law, and Gay Lussac’s Law) into one so that three variables may be studies together. Relationships: Same as in the original gas laws being combined. Problem: A sample of 1.5L of hydrogen gas has a temperature of 140ºC and a pressure of 0.68 atm. 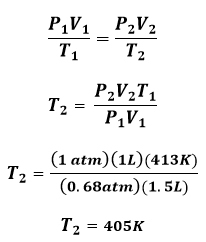 If the pressure changes to 1 atm and volume to 1L, what is the new temperature?